We can’t help it. The “itch” to get outside and get things rolling in the yard and garden can hardly be stopped on the first few nice days of March really needs to be scratched! Although it’s best to take it slowly, there are a couple of things one can accomplish in the yard early in the spring. First, wait until the lawn is dry and firming up before walking on it. Even foot traffic during the tender days as the frost leaves the ground can damage the grass or make it difficult to grow. This can happen when the soil is compacted under foot. Now go ahead and inspect the grass. Rather than raking, use your hands or a very light rake to pick up any sticks or piles of leaves or other debris that accumulated over winter. It’s advised that you avoid the practice of aggressively raking any dead material until the lawn if quite firm in late April or even May. This will reduce the amount of damage (ripping) that can be done to those grass plants as they are breaking dormancy an are in a very tender state. 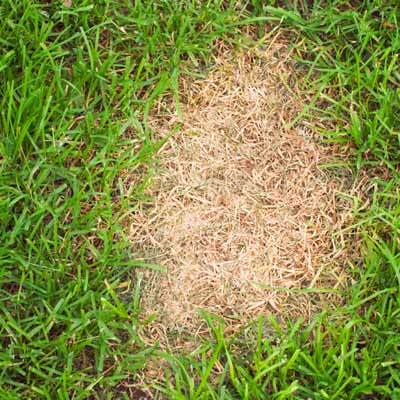 Although lawns can suffer from the build up of dead material called thatch, the best time to remove thatch in Minnesota is in late summer or early fall. This is a great calendar (right) from the University of Minnesota Extension Service explaining good times for undertaking certain lawn care activities. They have extensive information on their website on almost every subject regarding lawns. This is also a good time to neutralize any spots that have been killed by dog urine over the winter. This grass is dead and the spot needs a bit of treatment so new grass can grow. First, scratch away the old, dead grass. In southern Minnesota, treat the spot with Garden Gypsum. Liberally sprinkle this granular from of calcium all over the dead spot. Then, scratch it in to the soil a bit with a hoe or other tool. Finally, water it deeply. The next step is to replace the grass. You can seed it or sod it. Early in the year, the best way to do this is with seed because sod just won’t be available for a couple of months. You can use plain seed or a repair mix that incorporates mulch. A little bit of a head start is to spread some compost or top soil over the treated spot. Then spread the seed lightly without overcrowding. Aim for the seed coverage to look like what salt and pepper on scrambled eggs would look like. Then lightly drag the seed into the soil with the back of your hand or the back of a rake. You’re just making sure the seed is coming into contact with the soil rather than burying it. Now, in early spring, don’t water the new seed. The spring weather will probably take care of getting the seed off to a good start. In later April or May, you will need to water at once and keep the seed bed moist for 30 days while the seed grows. Once the new seed is cut twice it can be fertilized.